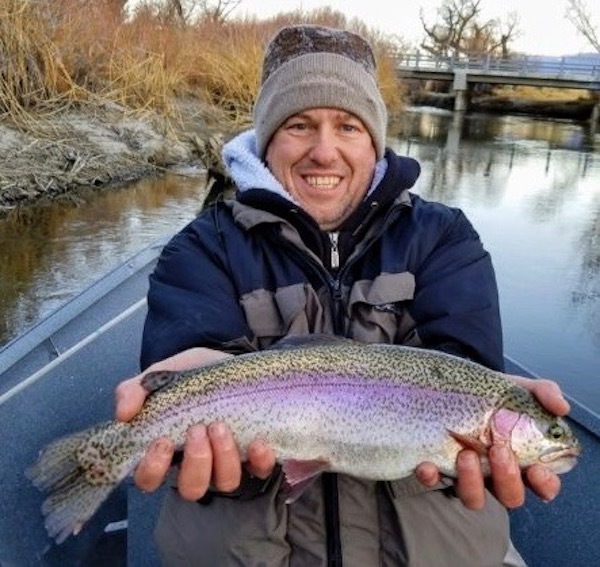 Scott Randall started his day with a few of these beautiful planted rainbows. Stocking efforts are much improved on the MO this year and it is showing in the fish counts. Doug Rodricks was his guide. Those of you who believe the wildfire that ravaged the wild trout section will improve access, and make fishing better; will be truly disappointed when the smoke clears. The fire has consumed the entire section from the PVR Campground down to Five Bridges Road as of 2/19/18. These type of fires historically remove vital oxygen with ash, super heat vital under water habitat in the riffle water, and destroy the riparian vegetation canopies that provide cover for the fish, as well as habitat for untold numbers of birds and animals. Fish kills are imminent with wildfires such as this. Uncontrolled wildfires of this nature have NO positive impacts, and should not be advertised as such. Most of the river is closed to access in the Bishop area. We will be off the river for a few days for safety reasons, and will update when more information becomes available. 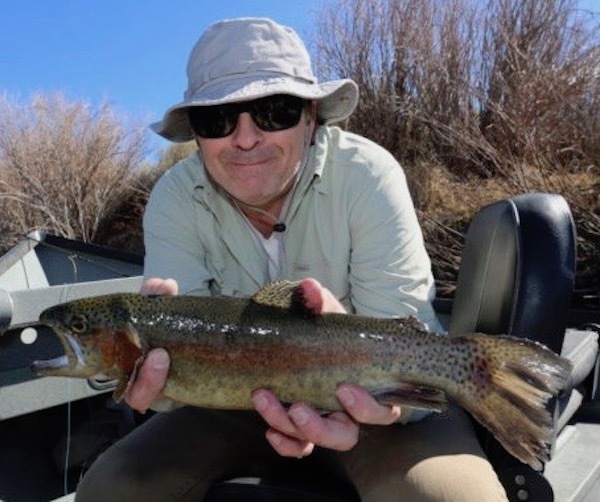 Up until we were forced off the river by the fire, guided drift boat trips have been very good for both numbers, & quality rainbows munching on streamers. 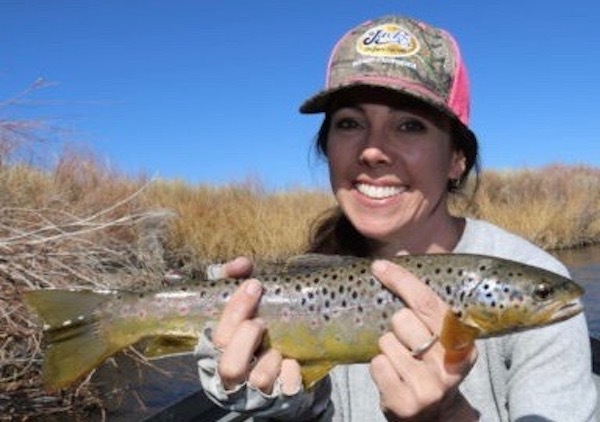 First time fly fisher Jackie Sarnecky showing off one of her nicer browns she “tip toed” into (inside joke) Fun day Jackie, thanks! Garry Creel (cool name) did well on his first float with me. Hot fly was the #16 Punk Perch. 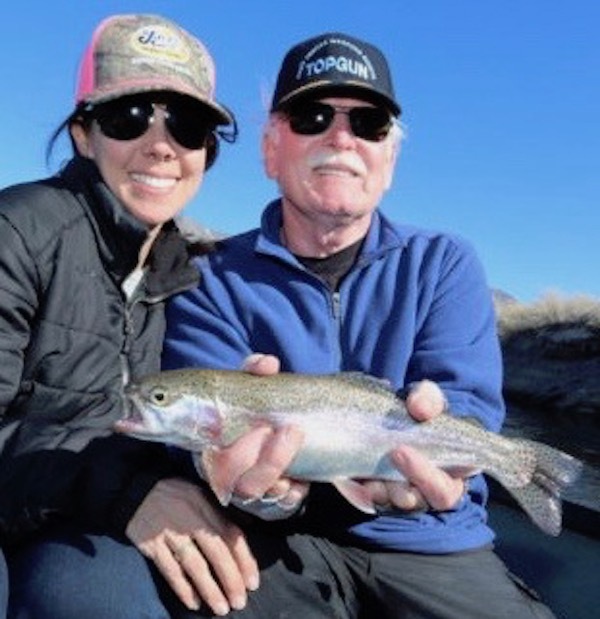 Veteran Drifter, & “Top Gun” vet Joe Sarnecky, treated his daughter Jackie to their first float together. Joe punished the fish on a near perfect day of drifting. Thanks buddy, good job.